You already know that eating lots of refined sugar can cause weight gain. But, did you know that sugar consumption also impacts the health of your bones? The answer to the question, “Why is Sugar Bad for You?” may surprise you! Vitamin K Supplement: Which Type is Best for Osteopenia and Osteoporosis Treatment? In the vitamin K supplement world, studies confirm a form of vitamin K2 called MK-7 is the emerging star for effective osteopenia and osteoporosis treatment. Make sure your supplement has this if you want good results. 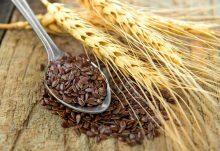 Should You Be Concerned About Flaxseed? Should You Be Concerned About Flax Seed Dangers? When the drug companies themselves start recommending “drug holidays” for certain osteoporosis patients to reduce the risk of serious bisphosphonates side effects, it’s time to take notice.